In 2012, when life was pre-kids, my wife and I found super cheap tickets to Vietnam. We instantly booked it and had an international adventure because, well, we were actually fun back then. We had no itinerary and it was one of the best trips we’ve had. Actually, it was going to be one of the best trips we ever had, except that I accidentally ruined it. Chapter 1 – Book it! Vietnam was amazing. On our way back home, we had an eight hour layover in Seoul, South Korea before the long haul over the Pacific to San Francisco. Neither of us had been to Korea either so we found a little airport tour which would take us on a bus into the city, tour of a few sites, and bring us back to the airport with plenty of time to spare. Our flight landed in the early morning and the weather wasn’t friendly. It was stormy and cold, but that didn’t stop us. We hopped on the bus. As we hit the road, the city was just waking up. It’s fascinating to see locals going to work and about their daily lives. I get absorbed visiting big cities so my face was glued out the window observing this new part of the world and how it works. The tour would take us to Gyeongbok Palace and then to Insadong Street Market and then back to the airport. As the bus pulled in, I was so excited that I didn’t watch where I was going. I stepped off the bus and immediately stepped directly into a giant puddle on the street. I let out a scream. If you know me, I’ve removed the word hate from my vocabulary and I’m all about the #huglife. But there is one thing on earth which I absolutely abhor. It causes me so much emotional and spiritual pain that I’ll instantly have an adult meltdown (in public if necessary). It’s getting my socks wet. If I step in any amount of water while wearing socks, I will literally short circuit. I can’t handle the moist, damp, and soggy feeling on my feet. Even as I type this, I’m getting chills. So gross, you guys. “Please don’t ruin Korea for me,” she replied rubbing her head. Guess what happened next? I ruined Korea for my wife. My wife dragged me to Gyeongbok Palace but it was no use. I could not function. Each step I took reminded me of how I wanted to curl up like a rollie pollie. My mind wandered to days when I’d put warm socks on right out of the dryer. I wanted to go home. “Say cheese!” said a fellow bus tourist as my wife handed him our phone to take a picture of us. Did I say cheese? Absolutely not. In fact, all of the pictures taken in Korea have me sulking to level infinity. This infuriated my wife even more. The next stop was Insadong Street Market. My wife, having listened to an hour of me protesting like an infant, got off the bus and walked straight into the first shop she saw. She walked back out clenching her teeth and handed me a pair of Gangnam style socks, pedicure slippers, and a plastic bag for my soaked situation. My wife. My savior. My guardian angel. I tried to kiss her but she instantly rejected my advance. You see, I was smart enough not to change out just that moment, because what if I step in another puddle, right? So what happened next? I ruined the rest of Korea obviously but just until we got back to the airport where I walked around the terminal, boarded the plane, and went through customs in my new pedicure slippers and Gangnam style socks. I didn’t care about the stares. My feet were warm again. 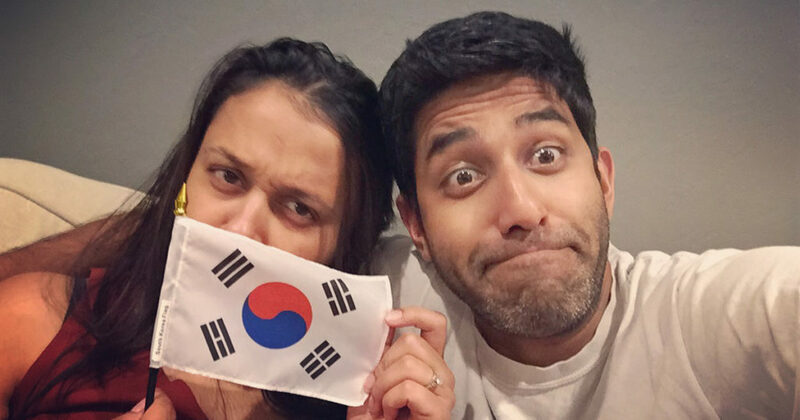 To this day, if anyone mentions Korea or we have Korean bbq with friends, my wife will lose her mind and tell everyone at the table how I’m a vacation-wrecker. I have to take her back now, but at least whenever we go next, I’ll watch out for puddles. Have you ever ruined a vacation? Comment and let me know! Follow the shenanigans on Facebook, Instagram, and Pinterest. Or email me directly to say hello!